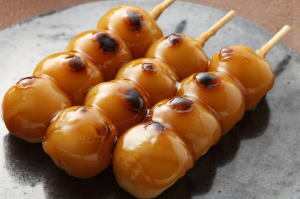 Mitarashi Dango ('みたらし団子', is classified into sweets), is known as Dumplings with Salty-sweet Sauce in English, and 御手洗丸子 (Yùshǒuxǐ wánzi) in Chinese. It is the Japanese style sweets. Rice Wheat Flour, Sugar and Soy Sauce.